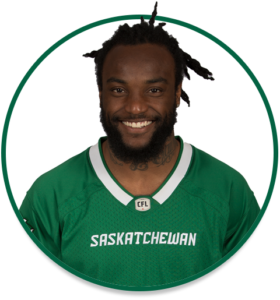 PRO: Signed with the Riders in February, 2016…signed with the Hamilton Tiger-Cats in July, 2014…signed with the Montreal Alouettes in May, 2012. 2018: Started 18 regular-season games and the Western Semi-Final…picked up 51 defensive tackles, two special-teams tackles, one quarterback sack, one forced fumble and one tackle for loss…also had three interceptions for 78 yards and a touchdown…added four defensive tackles in the playoffs…named CFL All-Star… named West Division All-Star. COLLEGE: Spent four seasons at Appalachian State (2008-11)…collected 168 defensive tackles, five interceptions and 59 pass breakups…named Second Team All-Southern in 2009 and 2010.